Yes, this venue is gorgeous—but can it handle the power needs of an event? Some venues may require you to rent a generator (or several) to avoid blowing any fuses with lighting, music, heaters/air conditioning, and other power demands a wedding brings. And if they do have on-site power, make sure you know where all the plugs are. Historical buildings often have far less power outlets than modern spaces, so make sure you have what you need for getting ready (especially if you’re plugging in hot hair tools) and the rest of the day. You may need an extension cord if you have a specific plan for where you’ll be needing things like lighting and audio equipment. For the most part, no one is aiming for rain on their wedding day, but everyone should consider a venue’s “rain plan” before booking. Some venues move outdoor weddings inside, others set up tents, others don’t have a backup at all. Make sure you know what the plan is and consider that you may be using it. In Southern California, you may also want to consider wildfire dangers. Is your venue surrounded by forest or in a known fire-prone area? What do they do if the venue is unavailable or damaged? Do they have partner venues they can work with in emergencies? Will your deposit be refunded? Of course you don’t want these things to happen, but if they do you’ll feel a lot better if you know the plan. When you imagine your wedding day, you probably aren’t thinking about cleaning up afterwards. But someone has to do it! Be sure to ask who is responsible for cleanup (it’s usually you) and when you’re required to have the venue clean. Some venues have to be cleaned immediately following the party whereas others allow you to clean up the next morning. Ask your wedding planner to help you come up with a cleanup plan (ideally one involving a cleaning staff and not you). Make sure you also get trash guidelines from your venue, because some spaces hold you responsible for any trash left on-site (even in trash bins). Are you envisioning a romantic, candle-lit first dance? Is your dog going to be your ring bearer? Don’t forget to check ahead about your venue’s rules and restrictions. Many venues prohibit candles or open flames of any kind. Sparklers are also commonly not allowed. Some venues also limit confetti throwing, animals, or food trucks on the property. Most LA venues also have music volume restrictions after 10pm (which is dictated by county law rather than the venue itself). If you’re able-bodied, you probably haven’t given much thought to accessibility, but if you have disabled guests you’ll definitely want to make sure you can accommodate them. If you’re expecting elderly guests, guests in wheelchairs, or guests who otherwise struggle with physical mobility, make sure to keep this in mind during venue hunting. Is the whole property wheelchair accessible? Historical buildings tend to be far less accessible than modern ones. Keep an eye out for step-up entryways, tight corridors, and non-accessible restrooms. Even people who don’t use wheelchairs may have mobility issues that make it difficult for them to traverse hills, uneven terrain, stairs, or long distances. How far will guests need to travel between parking and the ceremony space? How much of it is uphill? Ask the venue manager if they have designated accessible parking or a drop-off space. Depending on where you live, your venue rate may be subject to local taxes. Make sure to ask if those taxes are included in the quoted price or if they are additional (and get the full quote for how much that will be). Some venues may require gratuities for staff that are rarely included in the rate, so be sure to ask about any included gratuities and account for them in your budget. Venues may also expect you to cover clean-up costs and trash removal through them. Extra fees may apply if you want to have them move furniture or set up a dance floor. Get any additional costs cleared up from the start. PSST! Here’s a bonus for you—my complete wedding venue checklist! 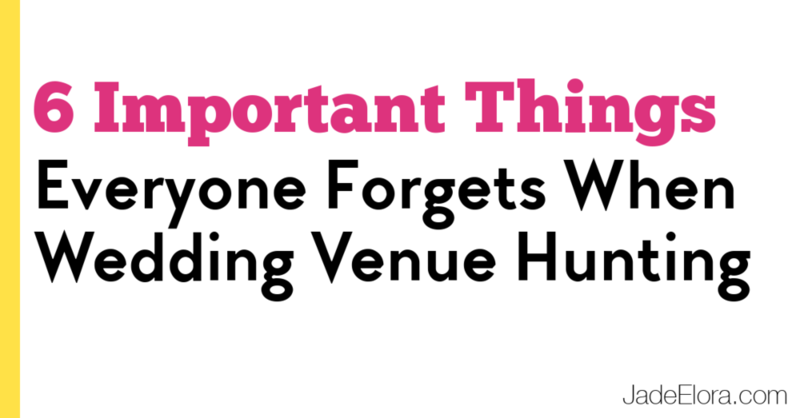 Make your venue hunt so much easier and take it with you on your tour! Get the free checklist plus more awesome wedding planning advice, inspiration, special offers, and freebies! You’re ready to start wedding planning: Awesome! But now what? Wedding planning can be a complicated web of to-dos, so here’s a basic list of where to get started and in what order. Whether you’re looking for a full-service planner or a ‘day of coordinator’, you’re going to want to hire them first. Planners are key in providing recommendations and consulting on big decisions, and often can help you save money on the other vendors you hire. Most people start off planning thinking “I can do this myself” only to eventually realize (after a lot of unneeded stress and extra costs) that they really do need a planner. Make the smart call and hire the planner before anything else. You’ll get to truly take advantage of all the value a professional brings to the table. For many couples the venue will be their biggest expense, so knowing what you’re spending is key to building an accurate budget. Details about the space will ultimately dictate other expenses, like whether or not you’ll need to account for furniture rentals, transportation, lighting, or portable restrooms. Venue availability will help narrow down your exact date, which most other vendors will require for booking. It also sets the tone for theme and décor decisions. Plus, since rental rates will likely increase over time, you’ll lock in the best rate by booking early. At this point, your next stop is the photographer. (Yay! Time to call me!) In-demand photographers can book up quickly, so if photography is important to you, you’ll want to book earlier over later. An added perk: If you’re planning on doing engagement photos, you can have them ready when you make your save the dates or set up your wedding website. Catering is usually the second biggest chunk of the wedding budget (next to venue), so it’s a good idea to start talking to caterers next. Knowing your budget for food is helpful because there are often unexpected costs in this category (ie. : kitchen and serving equipment, servers, generators, trash disposal, staff tips) Catering will help fill in some important logistics gaps (like whether or not you need a kitchen brought in to your venue). It’s a good idea to consult your florist as you start envisioning theme, colors, and décor. Some flowers may be out of season or over budget, so if your vision centers on a particular look, you’ll want to know before you really commit. Knowing your floral plan will help you decide how to fill in the rest of the décor. Skilled, established wedding vendors should have a portfolio that reflects their style and ability. If their portfolio features some great work and some less-than-stellar work, you probably will be able to expect the same inconsistency if they work at your wedding. You should also be wary of very contradictory styles. If a photographer has bright pastel images one minute and in the next switches to vintage black and white, you won't be able to know what to expect from them. (And in some cases, this can be a sign of a stolen or misleading portfolio.) You should like at least 70% of a vendor's work, anything less means they're probably not for you. Vendors want your business. Any professional wedding vendor will respond to you within 48 hours at most. The occasional slow email may be unavoidable (vendors are people too, after all), but if they consistently take several days with every response, they are not valuing you. When you're stressed out the week before your wedding, you'll regret having hired someone who leaves you hanging for days. Contracts are meant to protect both you as a client and the vendor. Having everything written down in advance helps everyone be clear on what they're committing to and what happens in case something goes wrong. If you're paying a vendor but have no contract, there's no guarantee as to where that money goes or what happens if they cancel. There are honest wedding vendors who just don't tend to use contracts, but they should be willing to provide you with everything in writing if you request it. If you can't get some kind of record of your agreement, you should walk away. Unless your vendor is new to the industry, a quick google search should turn up some customer reviews. If you can't find a Yelp page, Facebook reviews, a WeddingWire page, or something like that, this might be a red flag. There are genuine reasons a business might not be a member of review sites, but you should be able to find something. Testimonials on their own website can be useful, but since they're custom curated by the vendor you'll want to find some other referrals. If you've been quoted $1000 for the same cake everywhere else, and suddenly you've been quoted $500, there's a reason behind that—and they should be able to give you a good explanation. If the vendor is just starting out and gaining experience, a much lower price might make sense, but out-of-nowhere low prices can be a sign that something is up. It may mean the vendor is compromising on quality or service, or it could even mean they're untrustworthy. If someone's price is unusual, be skeptical and use your best judgement. When you meet in person with your vendor, you should walk away feeling excited about your wedding. If you feel odd, uncomfortable, or awkward, they're probably not the vendor for you. Insurance protects you, your venue, and everyone else from anything going wrong. Professional businesses need their own insurance if they have anyone on-site at your wedding, and many venues even require all vendors be insured. If a vendor doesn't invest in insurance, you know they're already okay with cutting corners. If a vendor is gossiping about other vendors or putting down other couples they've worked with, you should run in the other direction. 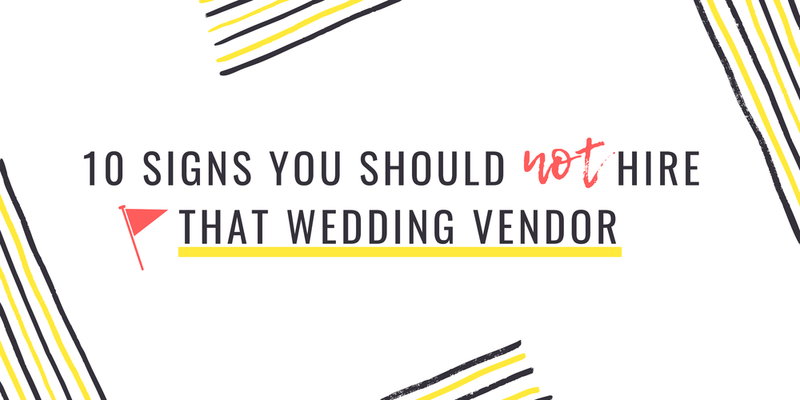 Wedding vendors should behave professionally and, while they can definitely let you know which vendors to avoid, they should be doing it in an appropriate and respectful way. The best wedding vendors build strong and positive industry relationships that you can benefit from as a client. And if they're complaining about other couples or making fun of them, you can never be sure they're not doing the same to you. Pricing is tough for small businesses, so some vendors may be hesitant to give you an exact number, but if you ask for a price, they should be able to give it to you. For some businesses this will be a price list or catalog and for others this will be a detailed invoice. Prices should be predictable and consistent, and they should be able to tell you if and when prices will increase. Being late happens to everyone, but when vendor meetings always start with 30 minutes of toe-tapping waiting for them to arrive, it's a problem. They aren't respecting your time and they'll likely be unpredictable and late on your wedding day.